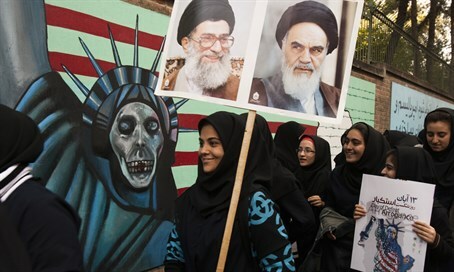 Iran's top religious body rules that despite nuclear deal reached with world powers, America is still Islamic Republic's sworn enemy. Iran's President Hassan Rouhani, who as a cleric is also a member of the Assembly of Experts, took office in 2013 and has since sought to undo sanctions imposed by western countries over Tehran's nuclear program. The nuclear agreement reached on July 14 with six world powers - Britain, China, France, Russia, the United States and Germany - has helped revive Iran's political stating with the European countries, and opened the doors to billions of dollars in sanctions relief. But despite the nuclear talks and the intricate role US Secretary of State John Kerry played in getting the deal across the line, there is currently little prospect of normalization between Iran and the United States. Iran currently stands as the leading state sponsor of terrorism in the world. The statement Tuesday follows an affirmation by a senior Iranian official that the Islamic Republic still remains committed to the destruction of Israel, a key US ally. "Our positions against the usurper Zionist regime have not changed at all; Israel should be annihilated and this is our ultimate slogan," Iranian Parliament Speaker's Adviser for International Affairs Hossein Sheikholeslam said last week.